Cable TV personality Jesse James isn’t a “dead man”; he is just a brazen liar. Despite numerous irrefutable facts to the contrary, TV’s Jesse James continues to claim he set a World Land Speed Record with the old The Dees/Milodon Engineering/Davis B Streamliner that was reworked to accept a hydrogen-gulping V8. There was no record. In my opinion, Mr. James is a simply a brazen liar who cheats all those good men and women who have for decades honestly laid it on the line to ink a spot in the record books. The claim of besting BMW’s FIA ratified hydrogen-powered World Record Speed Record on June 16th on the southern California El Mirage dry lake is without merit since the activities were conducted without benefit of any motorsports sanctioning authority. I have verified that James never made application for a record attempt to ANY sanctioning authority anywhere in the USA or Europe. That’s like saying you won the Indy 500 without bothering to qualify for one of the 33 starting spots. The Southern California Timing Association (SCTA) is the leading land speed racing authority in the United States demanded its name be removed from any of James’ activities and has obtained retractions from noted publications on this point. The baseless speed stunt was reportedly for “the season-ending episode of James’s TV show, Jesse James is a Dead Man. The episode was set to air in early August. I have written to Spike TV executives informing them of the lie and asking that it not be perpetuated in the upcoming episode. I have not been given the courtesy of a reply. James hired land speed race Mike Cook Motorsports to rework the old streamliner to accept a 572-cubic-inch twin-turbo Chevrolet big block. It is puzzling that Cook, a noted and successful land speed racer, would align himself with such disingenuous racing activity. World Land Speed Records require two runs over a one-mile course within one hour. Any world record holder will tell you it’s quite a technical feat to hold speed for a full mile. James was 5,148 feet short. According Chronologic, the car was timed only one-way for a total of 132 feet and made only three or four passes in an eight to ten-hour period. Mr. James efforts count for absolutely nothing on the world motorsports stage and amount to little more than a self-promoting “TV racer” PR stunt since he chose to ignore the sport’s sanctioning rules that have applied to all racers and certified records for the past 80 years. James claims to have bested the FIA ratified BMW HR2 record of 185 mph. The internal combustion engine BMW set 9 international and FIA-ratified land-speed records for hydrogen cars at the Miramas Proving Grounds in France. He did not. So why am I so upset about all this? Simple. 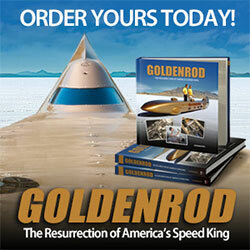 The bedrock of land speed racing is the record. Every single event held anywhere in the world has at its nucleus only one prize – the chance to set a speed record. There is no purse, no money, and people in the sport race for personal satisfaction, for honor, and good-natured bragging rights. The honestly attempted, and sincerely earned, place in the history books decrees the driver was cognizant of the rules, played fair and triumphed over the clocks with their chosen speed machine — that their ideas, their efforts and their hopes were realized in earnest upon a simple piece of paper called a time slip. A record is the truth about an act of driving courage. A record creates a trust in the record holder, the sanctioning body and those who labored for the honor. A record must always imply a lack of deceit. The James press release was given to sponsors who posted the false record claim on their websites and some sent out press releases of their own. One sponsor went so far as to use the false claim as part of a implied solicitation for stock investment. That really got me torqued and I called the company’s ethics hotline and the SEC to file a formal complaint. Luckily, I was able to convince the company directors to realized they had been hoodwinked which made any association to the claim a serious ethics violation. The company promptly removed all such claims from its website and stopped further press release distribution. It cost them $15,000. in legal fees to sort out James lying mess. “It started innocently, a TV show personality going out to El Mirage with a car and running faster than an established record. Before you know it his PR guys are saying it’s a world record. To top it off it was inferred that that the runs were sanctioned by the S.C.T.A. Both are false. Then the fun began. The S.C.T.A. President sent out a reply that the S.C.T.A. wasn’t involved with the runs. Then more e-mails started flying about saying that the rules don’t matter and that running over the record makes him king of the hill. I probably got 10 e-mails within an hour from different parties at odds with each other over the happening. To add insult to injury name calling has taken place. What’s embarrassing is that it’s all taking place in our public forum called the internet. The S.C.T.A. prides itself in being a family sport and the name calling makes us all look like a bunch of children and once again contributes to the hot rodders image of being bad boys. Anyone who knows Miller will tell you he is one of the most easy to get along with guys you’ll ever meet. That he takes such a stand gives you an idea of the gravity of the situation. Were James to claim he didn’t know any better it would be a deli case full of baloney. Andrew Berg, a producer of the James’ television show contacted me via email many months ago asking for my help to understand the sport, its rules and regulations for record setting. I spent more than an hour on the phone with the guy explaining in detail what was required to set a national and world record. I offered, as I have to countless other LSR neophytes, to help out in any way I could to make the team’s first experience in the sport rewarding. I never heard from Berg again. When I contacted Mr. James to explain the fraudulent claim, he responded with a short crude retort that reminded this writer that vulgarity is indeed the refuge of a destitute mind. James’ crude behavior was then spewed at S.C.T.A. officials. This reflected badly on the member club he joined. The LSR Car Club moved quickly to vote James “a member not in good standing” which simply means he will not be allowed to race at an S.C.T.A. El Mirage dry lakes event until the matter is resolved. I have never met Mr. James, never want to, yet hope he will rectify this whole sordid affair by playing fair and show the world what his machine is honestly capable of doing, if not for himself, then for his team who doubtless put in a great deal of effort developing the alternate fuel car. Until then, I remain outraged that this TV personality dares to claim fraternity with those people who, in some cases, have given their lives in pursuit of a World Land Speed Record. “The celebrity Jesse James has built a record for himself of snubbing authorities, in his vainglorious effort to personify himself as some imaginary kind of outlaw. Spike TV’s promotion for Jesse James is a Dead Man announces that Jesse James is a direct descendant of the outlaw Jesse James. This in fact is a falsehood and misrepresentation. Mr. James has been invited to prove his claim to the James family, to which he professes to belong. He never has done so. Instead, he continues to falsely misrepresent himself.